The Mottisfont Angel, originally uploaded by richardr. The name ‘Mottisfont’ is probably derived from the Old English motes funta, meaning ‘spring near the confluence’ or ‘spring of the moot’ or possibly ‘spring of the stone’ (from the Old English motere: sonte). Plentiful water and fish, good communications and fertile land protected from the worst weather made this an ideal setting for the religious community which flourished here from 1201, providing hospitality for the pilgrims that its sacred relics attracted.The original building was a priory, founded by William Briwere in 1201. He was a trusted adviser to Richard the Lionheart, King John and Henry III, and he was one of the barons who signed the Magna Carta. At the dissolution of the Monasteries the priory was acquired by William Lord Sandys, who converted it to a house.By the right inner corner of the Abbey wall is a niche where a portion of what might be an arch original to the old monastic abbey remains. Nestled in here is a mosaic of an angelic figure kneeling in prayer. This is the ‘Angel of Mottisfont’, and far from being an ancient icon it is the work of a Russian artist, poet and lover named Boris Anrep. When Boris returned to St Petersburg from England at the start of the First World War he became a leading light of that group of poets led by Nikolai Gumilyov and his wife Anna Akhmatova. The two fell in love and carried on an affair while Anna’s husband was serving with the cavalry. At the war’s end, of course, came the Revolution. Anrep had decided to return to England to live, Anna could not bear to leave Mother Russia. Despising and loving him at the same time, she wrote two entire collections of poems dedicated to him. They each continued with very convoluted love lives, but never met again. Tile, originally uploaded by brettmjohnson. 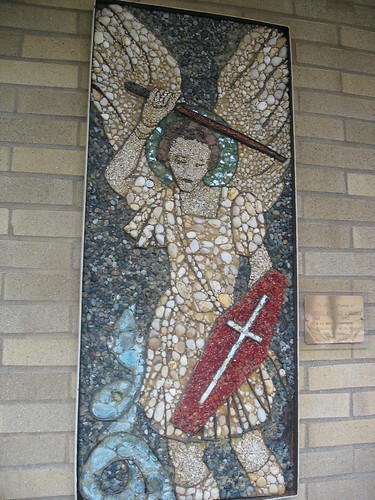 St. Michael Mosaic, originally uploaded by Fossil Freak. To be the champion of God’s people, the Jews in the Old Law, the Christians in the New Testament; therefore he was the patron of the Church, and of the orders of knights during the Middle Ages. To call away from earth and bring men’s souls to judgment (“signifer S. Michael repraesentet eas in lucam sanctam”, Offert. Miss Defunct. “Constituit eum principem super animas suscipiendas”, Antiph. off. Cf. “Hermas”, Pastor, I, 3, Simil. VIII, 3). Regarding his rank in the celestial hierarchy opinions vary; St. Basil (Hom. de angelis) and other Greek Fathers, also Salmeron, Bellarmine, etc., place St. Michael over all the angels; they say he is called “archangel” because he is the prince of the other angels; others (cf. 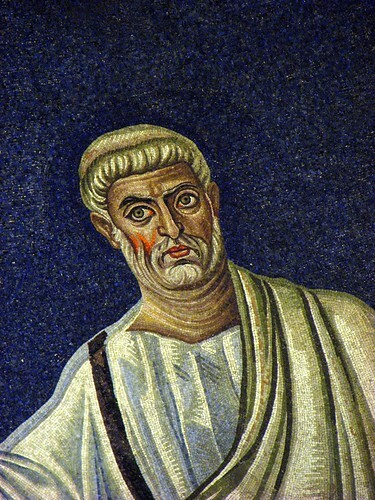 P. Bonaventura, op. cit.) believe that he is the prince of the seraphim, the first of the nine angelic orders. But, according to St. Thomas (Summa Ia.113.3) he is the prince of the last and lowest choir, the angels. The Roman Liturgy seems to follow the Greek Fathers; it calls him “Princeps militiae coelestis quem honorificant angelorum cives”. The hymn of the Mozarabic Breviary places St. Michael even above the Twenty-four Elders. The Greek Liturgy styles him Archistrategos, “highest general” (cf. Menaea, 8 Nov. and 6 Sept.). 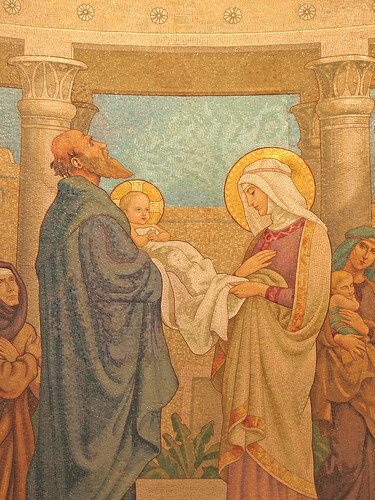 Simeon carrying the Lord, originally uploaded by Lawrence OP. Circle of moons, originally uploaded by complexify (David Gilford). Tonight!This ABC feature written by Bernie Hobbs is the place to go for information AND for answers to any question that the kids might throw at you. Christ returning, originally uploaded by Nick in exsilio. Basilica dei Santi Cosma e Damiano. 6th cent. 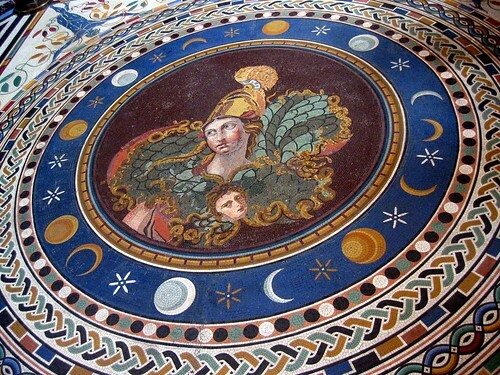 The ancient Roman fabric was Christianized and dedicated to Sancti Cosma et Damiano in 527 , when Theodoric the Great, king of the Ostrogoths, and his daughter Amalasuntha donated the library of the Forum of Peace and a portion of the so-called Temple of Romulus to Pope Felix IV. The pope united the two buildings to create a basilica devoted to two Greek brothers and saints, Cosmas and Damian, in contrast with the ancient pagan cult of the two brothers Castor and Pollux, who had been worshipped in the nearby Temple of Castor and Pollux. 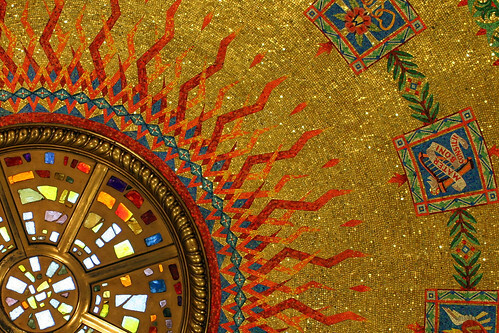 The apse was decorated with a Roman-Byzantine mosaic, representing a parousia, the Second Coming of Christ at the end of time. The bodies of Saints Mark and Marcellian were translated, perhaps in the ninth century, to this church, where they were rediscovered in 1583 during the reign of Pope Gregory XIII. Next to the new entrance to the complex, there are the rooms with the original marble paving of the Forum of Peace, and the wall where the 150 marble slabs of the Forma Urbis Romae were hung. Through the cloister, the entrance to the church opens on the side of the single nave. The plan of the basilica followed the norms of the Counter-Reformation: a single nave, with three chapels per side, and the big apse, which now looks quite oversized because of the reduction in height of the 17th century restoration, framed by the triumphal arch, also mutilated by that restoration. 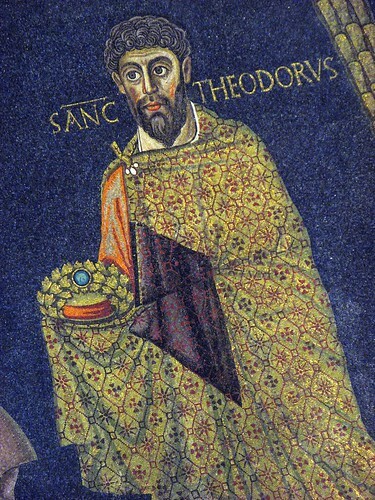 S. Theodorus, originally uploaded by Nick in exsilio. S. Peter, originally uploaded by Nick in exsilio. 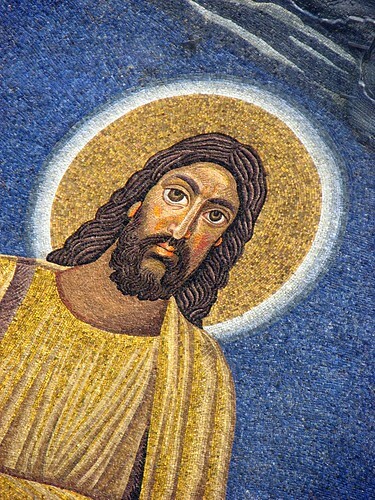 The mosaics are masterpieces of 6th-7th century art. 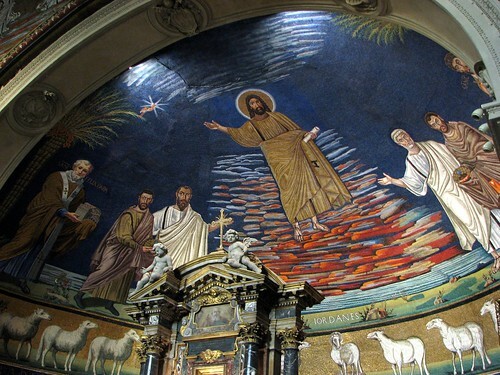 In the middle is Christ, with Saint Peter presenting Saint Cosmas and Saint Teodorus (right), and Saint Paul presenting Saint Damian and Pope Felix IV; the latter holds a model of the church. 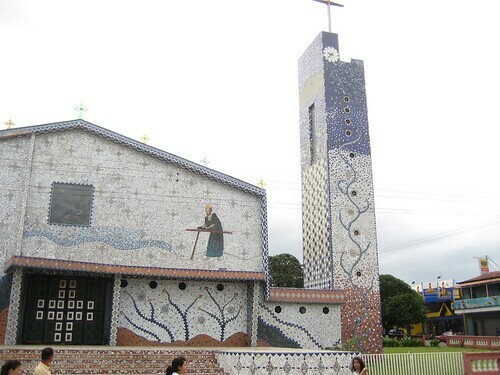 Basilica of Ss. Cosmas and Damian, originally uploaded by Nick in exsilio. 23.12.2006: (left to right): Pope Felix IV, S. Damian, S. Paul, Christ, S. Peter, S. Cosmas. 6th cent (though Pope Felix has clearly been tarted up at some later point). He erected the church on the site of a temple to the Castori (Romulus and Remus) in 527. Mosaic, but I didn’t hear it., originally uploaded by IntangibleArts.